Eating less sugar could be the remedy for a number of health crises facing America. The effects of too much sugar in the diet can be seen around the hospital rooms of America, as bulging waistlines bring on metabolic syndrome and an increased risk for heart disease. The average American consumes about 82 grams (g) of sugar per day (about 19.5 teaspoons), while healthcare professionals recommend dropping that number to 50 g (12 teaspoons) daily. But the reality is that if you want to get healthier and limit your risk for medical conditions such as diabetes, obesity, and stroke, getting down to 25 g or less each day is ideal. Too much sugar is killing Americans and people around the world. Hidden sugars added to sauces, yogurts, beverages, and other household staples are the main culprits behind the obesity, diabetes, and heart disease epidemics. And unfortunately, most people have no idea how much sugar they’re eating every day. Even “healthy” foods like yogurt or salad dressings often resemble dessert more closely than nutritious options. So how do you eat less sugar? Thankfully, it can be done with a few simple steps. You can also limit your sugar intake without sacrificing the tastes you love. You may even find that sugar alternatives are more satisfying and flavorful than what you’ve been eating for years. Modern day humans eat a lot of sugar for multiple reasons, and few of them are actually their fault. The main factors at play in sugar addiction are the sugar industry and one’s own body. For some, the neurotransmitters serotonin and dopamine play a big role in food choices. At the end of the day, it will take some real effort to stop eating sugar. First, let’s examine the sugar industry. It’s come to light that the sugar industry was essentially responsible for the decades-long war on fat, which declared saturated fats and cholesterol the enemy of good heart health. It seems logical that dietary fat equates to body fat and that the more you eat, the more your body accumulates. Unfortunately, this could not be further from the truth. The climbing obesity rates and increasing numbers of deaths due to type 2 diabetes and heart disease complications are not correlated with fat intake, but rather added sugar intake. The war on fat saw beneficial fats removed from foods and replaced with sugar or other sweeteners, like high-fructose corn syrup, as flavoring agents. Added sugars and sweeteners are loaded into virtually every packaged product you buy, even though research repeatedly indicates this practice is the No. 1 problem in today’s dietary landscape. Not only do these sugars lead to health problems, but they also don’t provide any satiety. You can eat them all day without ever getting full. When you’re feeling a little down, one of the fastest ways to lift your mood is to give your serotonin levels a boost, which can be done by eating a sugar treat. Serotonin is thought to regulate happiness, mood, and anxiety. Carbohydrates can increase serum serotonin very well, and in return, send out a hit of dopamine to make you feel better. But you can build a tolerance—you start needing to eat more to perceive that same dopamine boost. It’s basically an addiction. And food manufacturers know this. It’s why they keep adding more sugar, so that you will continue to buy products—no matter what they are. Add to these a soda or a sugary snack during the day, and it’s easy to see how all those grams add up! What Are Added Sugars, and Why Are They Bad? Not all sugars are bad. Sugars that occur naturally in food products like fruit, dairy, whole grains, and vegetables are not going to throw your metabolism out of whack like repeated exposure to added sugars will. The differences are multifaceted. First, these natural sugars are part of a bigger picture that includes fiber. When food is consumed as a whole, it functions as a sum of its parts. Naturally occurring fibers slow the absorption of naturally occurring sugars, and balance can be achieved. The fiber and other nutrients also provide feelings of satisfaction, so you’ll get full. Added sugars are refined sugars. They are included into products as an ingredient and are therefore metabolized differently. This is why they are so dangerous—they go straight into the blood, raising your blood sugar so your pancreas releases insulin to send it to your cells for energy. However, your cells can only take so much and all the leftover is stored as fat. But that’s only the beginning of the problem—the more often this happens, the more insulin-resistant your cells become, and the body gets confused. So much insulin is being made and so much sugar is in the blood, but there is nowhere for any of it to go. Now, you’ve got metabolic syndrome and are on the road to type 2 diabetes. And although you may have been led to believe those plaques are only caused by cholesterol from fatty foods, research suggests that they are not—refined sugars are also to blame. This hardening of the arteries can lead to stroke, heart attack, or heart failure. The effects of too much sugar are dangerous and deadly. Eating less sugar is going to take planning and patience until you develop new habits. Make shopping lists and do your best to stop yourself from thinking about sugar all the time. 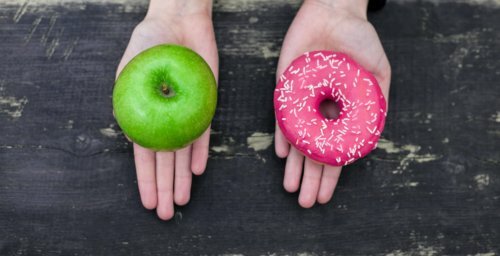 Obsessing over sugar will likely lead to failure and misery, so start by educating yourself and trying to make better decisions. Breakfast is a meal that, over the years, has changed from a healthy staple to a feast more like dessert. You might not be eating “Pop Tarts” or “Frosted Flakes” in the morning, but it’s highly likely that the products you consider “breakfast foods” are teeming with sugar. You may not know this because the sugar is hidden. And unfortunately, some of the items you may eat have more sugar than children’s cereal or your favorite dessert. If you just can’t imagine yourself with a grain-less breakfast, try to change the food you eat. Instead of Danishes, white toast, and muffins, try plain “Cheerios” (maybe add some fruit for sweetness), plain oatmeal, or whole grain toast. This is a big one, and probably the best thing you can do to bring sugar intake down to a reasonable level. Eliminate all soda from your diet, no matter what. You’re unlikely to benefit from switching to diet drinks—sugar alternative sweeteners can create health problems, too. Soda is essentially liquefied sugar. And this isn’t just true for fizzy soda; sports drinks, energy drinks, and iced tea are just as sugar heavy. A single 16-oz. bottle of cola, for example, has about 52 g of sugar—more than you should consume in day. Therefore, it’s not hard to see why the federal government says sweetened beverages are the biggest source of added sugar in the American diet, representing 47% of consumption. And drinking a glass of these drinks won’t ever make you feel full—if they did, manufacturers wouldn’t sell 16 ounces as a single serving—there is no nutrition and no satiety. Drink a 16-oz. glass of milk or water instead and see how you feel! People may believe they are addicted to the caffeine or carbonation in soda, but there are some really easy alternatives. Caffeine alternatives: If it’s the caffeine you crave, you can easily get a similar dosage from coffee or tea—just avoid the sugar-laden specialty options. Carbonated alternatives: If it’s the fizz you’re after, try club soda, seltzer, or sparkling water. These options have successfully weaned people off soda and saved them the sugar—these decisions can change your life. Squeeze some fresh lime juice, orange juice, or grapefruit juice into your drink to add a little flavor. If you must, a dash of prepared juice can do it. Which brings us to juice—orange, grapefruit, and other supposedly healthy commercial fruit juices. These are essentially soda. If you want the taste and nutrients, have a glass of water and eat an orange or a grapefruit. You’ll get all the nutrients plus some filling fiber! Next to breakfast foods, the sneakiest places sugars hide are in sauces, dressings, and other condiments. Did you know that light or non-fat mayonnaise is probably more harmful to your health than the full-fat option? Probably not. The sugars producers add to retain flavor when the fat is removed are wreaking havoc on your health. It’s the same with ketchup, pasta sauce, and salad dressings. Many brands of ketchup, for example, have sweeteners listed as the first two ingredients. Barbecue sauces are heavy on sugar and high-fructose corn syrup. But the realm of sauces and seasonings can be pretty easy to navigate. There are a number of condiments that are sugar free—mayo, mustard, and hot sauce are all sugar-free. There are also sugar-free ketchup options, but they are usually filled with artificial sweeteners that can compromise your gut health. Also, instead of buying sauces and salad dressings, you can make your own. This way, you can play with ingredients to suit your tastes. Sauces can be made with purees or with a mayo base, and salad dressings can be olive oil-based. Seasonings like garlic, oregano, cayenne pepper, and black pepper are also a great way to add flavor without too much sugar. Shop the perimeter of your grocery store. Most stores have all the nutritious items like produce, dairy, and meat along the perimeter. Avoid packaged foods. When you buy them, read the ingredients carefully. Have sugar sometimes, but limit your intake. Try eliminating sugar for a full month, and see if there is anything you can’t live without. There probably won’t be. Limit restaurant or take out meals and try to cook food at home. Always have a snack—fruit, veggies, nuts—on hand to prevent snacking on sugary items. Rethink dessert, and if you need it, use fruit and nuts. Avoiding added sugars is really about changing your habits and they way you analyze food. A simple guide is to avoid packaged foods and focus on cooking your own meals. Eating less sugar is possible if you have a plan and know what to look for. Try these suggestions and watch your weight—and risk for major diseases—go down. Kearns, C., at al., “Sugar industry sponsorship of germ-free rodent studies linking sucrose to hyperlipidemia and cancer: An historical analysis of internal documents,” PLOS Biology, November 21, 2017, DOI: https://doi.org/10.1371/journal.pbio.2003460; http://journals.plos.org/plosbiology/article?id=10.1371/journal.pbio.2003460, last accessed March 15, 2018. O’Connor, A., “Sugar Industry Long Downplayed Potential Harms,” The New York Times, November 21, 2017; https://www.nytimes.com/2017/11/21/well/eat/sugar-industry-long-downplayed-potential-harms-of-sugar.html, last accessed March 15, 2018. Kearns., C., et al, “Sugar Industry and Coronary Heart Disease Research,” JAMA Internal Medicine, Nov. 2016; 176(11):1680-1685; DOI:10.1001/jamainternmed.2016.5394; https://jamanetwork.com/journals/jamainternalmedicine/article-abstract/2548255?redirect=true, last accessed March 15, 2018. Lustig, R., “The Most Unhappy of Pleasures: This Is Your Brain on Sugar,” The Atlantic, February 21, 2012; https://www.theatlantic.com/health/archive/2012/02/the-most-unhappy-of-pleasures-this-is-your-brain-on-sugar/253341/, last accessed March 15, 2018. DiNicolantonio, J., et al., “The Evidence for Saturated Fat and for Sugar Related to Coronary Heart Disease,” Progress in Cardiovascular Diseases, March to April 2016; 58(5):464-72; DOI: 10.1016/j.pcad.2015.11.006; https://www.ncbi.nlm.nih.gov/pmc/articles/PMC4856550/, last accessed March 15, 2018. Leonhardt, D., “How to Stop Eating Sugar,” The New York Times, 2018; https://www.nytimes.com/guides/smarterliving/how-to-stop-eating-sugar, last accessed March 15, 2018.